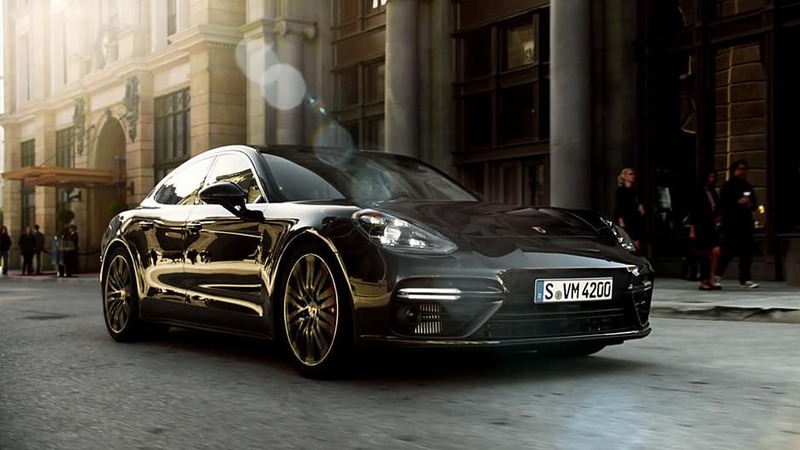 The Porsche Panamera masterfully combines sports car power with luxury car style. It’s time to reevaluate the way you think about sedans with the new Porsche Panamera. 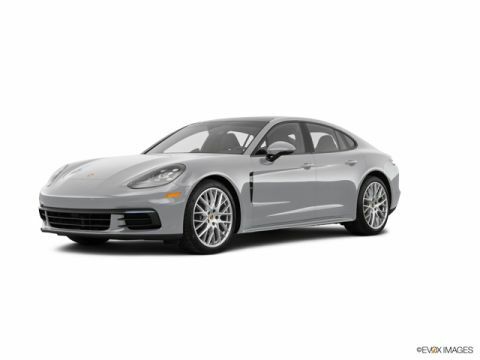 A four-door alternative to the classic sports car, the Panamera demands your undivided attention with its contoured body, athletic stance, and sloping rear roofline. Luxurious refinement follows into the interior where you’ll discover a cockpit designed with the driver in mind. The cockpit features an ascending center console that allows quick movement between the steering wheel and gear selector while an available massaging sport seat ensures you travel everywhere in comfort. 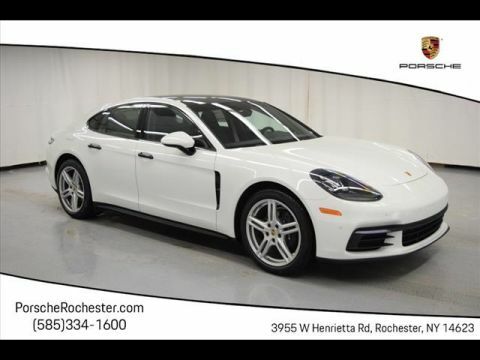 Whether you’re meeting clients in Irondequoit, racing along back roads to Webster, or meeting friends in Fairport, the new Porsche Panamera ensures a luxurious ride. 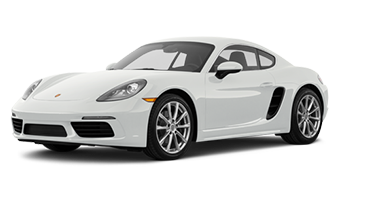 The Porsche Panamera stands out from other sedans for more reasons than just its impeccable styling, but because of its powerful twin-turbo V-6 and V-8 engines as well. These engines deliver up to 550 horsepower, making it possible for the Panamera to shoot from 0 to 60 in as little as 3.6 seconds. Factor in the Porsche Traction Management and Active Suspension Management systems, and the Panamera makes any roadway feel like a racetrack. 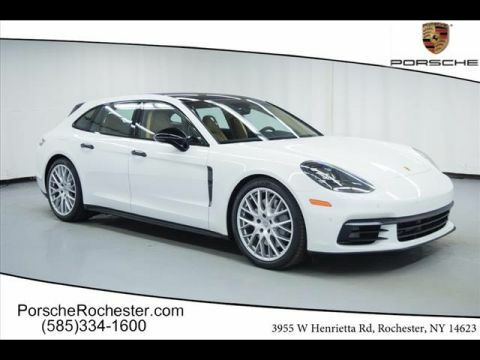 Schedule a test drive of the new Porsche Panamera today with Porsche Rochester and discover what you’ve been missing. While the new Porsche Panamera defies expectations by being a four-door sedan, its styling is still undeniably Porsche. Rolling onto the scene with a wide stance, 19-inch wheels, and LED lights, the Panamera is eye-catching from every angle. The new Porsche Panamera is changing the sports car game, ensuring it stands out on the road. This sedan provides the athletic styling you want from a sports car with the convenience of four doors instead of two. 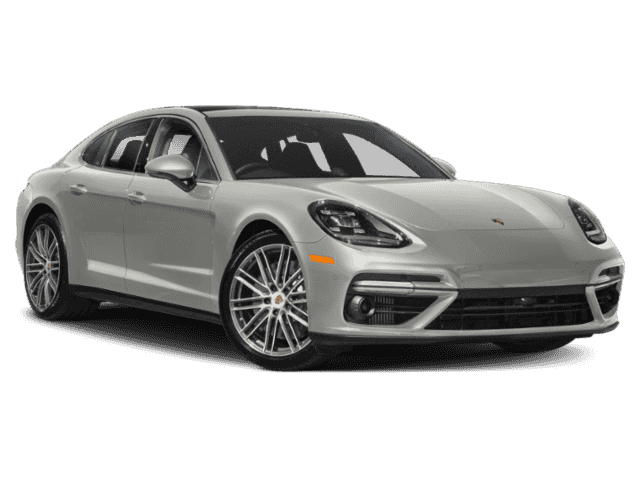 The new Porsche Panamera’s silhouette is unmistakably Porsche with its sleek, contoured body, black air outlet grills, and sloping rear roofline. A wide stance completes this sporty sedan’s athletic design. Opt for the Porsche Panamera’s available Porsche Dynamic Light System that provides LED headlights with dynamic range adjustment, dynamic cornering, and speed-sensitive headlight range control. Never get lost in the dark again. Choose how you spin in the new Porsche Panamera with up to 15 standout wheel options. Whichever design you choose, the Panamera’s eye-catching Porsche logo in the center guarantees its curb appeal is undeniable. 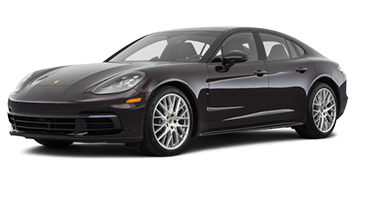 The new Porsche Panamera is available in a wide selection of colors, from a sleek black to a metallic green. If you don’t see a color that catches your fancy, you can make a custom color instead. The new Porsche Panamera doesn’t hold back when it comes to superior comfort and styling. Wherever the road takes you, you’ll travel in comfort courtesy of the Panamera’s sport seats, four-zone climate control, and ambient lighting. Porsche designed the new Panamera’s cockpit with the driver at the forefront of thought. 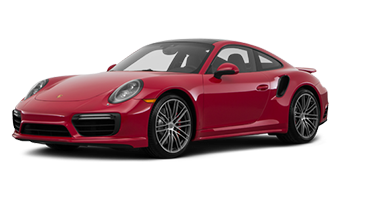 It features an ascending center console that allows for quick movements to the gear selector, a multifunction sports steering wheel, and a high-resolution 12-inch touchscreen display. 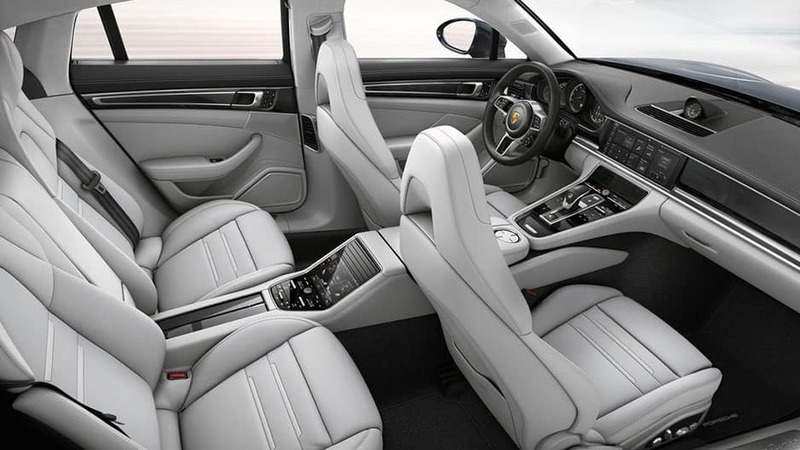 Give your tired back muscles a relaxing treat with the Porsche Panamera’s available massaging sport seats. Offering five programs and five intensity levels, even the longest ride is enjoyable. With the Porsche Panamera’s four-zone automatic climate control, you, your front passenger, and both rear passengers can choose individual climate settings so everyone rides comfortably. Up your comfort level in the Porsche Panamera with optional ambient lighting. Available in seven colors with the option to adjust the intensity, it’s one more thing that sets the Panamera apart from other sporty sedans. Brighten the Porsche Panamera’s interior with the panoramic sunroof. Press a button to tilt and open the front panel, allowing fresh air to enter the cabin. Stay connected on the road in the Porsche Panamera, thanks to an array of advanced tech features. Sync your mobile device to the Porsche Communication System, pick your favorite playlist, and enjoy the ride. 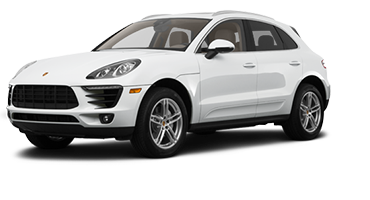 The innovative Porsche Communication Management system is your source of entertainment on the road. Sync your mobile device via Bluetooth® or USB and enjoy easy access to your music library, and the ability to answer calls and texts hands-free. Bring the concert on the road with you in the Porsche Panamera, courtesy of the Burmester® High-End 3D Surround Sound system. This sound system boasts 1,455 watts, 21 speakers, and an active subwoofer, so you’re surrounded by crystal-clear audio wherever you go. Keep your rear passengers entertained on long drives with the Porsche Panamera’s Rear Seat Entertainment system. This system features two 10-inch screens mounted on the front seat backs, an internal 32 GB memory, USB, and Bluetooth®. It also gives you the option to connect to the internet and gain access to up to a million apps, games, and movies. Never miss a thing in the new Porsche Panamera with the Connect Plus module. 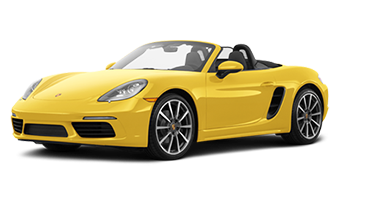 This module provides a wireless internet access point right inside your sports car, allowing you to get the most out of the Porsche Communication Management system while staying in the loop on the road. Retrieve important vehicle data and remotely control certain functions with the Porsche Car Connect app. Download the app onto your smartphone or Apple Watch® and keep an eye on the Porsche Panamera, even when you’re not around. Travel anywhere with peace of mind in the new Porsche Panamera, courtesy of an array of advanced safety features designed to keep you safe. The Panamera has your back, with systems such as Lane Change Alert and ParkAssist helping you detect and prevent potential collisions. The new Porsche Panamera’s Adaptive Cruise Control uses radar technology to maintain a set distance from the vehicle ahead of you. If the systems senses you’re approaching a slower vehicle, it decelerates to maintain your preset following distance and accelerates back to the cruising speed when that vehicle is no longer there. Using radar technology, the Porsche Panamera’s Lane Change Assist detects when a vehicle enters your blind zone, and alerts you with a visual icon in the corresponding side-view mirror. Lane Keep Assist uses camera technology to detect defined road markings. If you begin to drift out of your lane unintentionally, it will get you back on track with gentle pull on the steering wheel. Working alongside the rearview camera, the Porsche Panamera’s ParkAssist technology detects when obstacles are in front or behind you while parking. When it detects an object, the system alerts you with an audible and visual warning, so you can avoid it. Opt for the Porsche Panamera’s available Surround View system and take your backing up game to the next level. Using three high-resolution cameras and the standard rearview camera, the system creates a bird view of the area around the Panamera on the display screen. The new Porsche Panamera’s adrenaline-pumping power and precision handling is the cherry on top of a luxurious package. 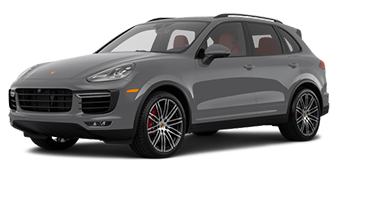 Feel the power of the twin-turbo engines, as systems such as Porsche Active Suspension Management offer a racetrack-like driving experience. Get your heart racing in the new Porsche Panamera courtesy of its adrenaline-pumping twin-turbo V-6 and V-8 engine. This beast delivers up to 550 horsepower, taking you from 0 to 60 in as few as 3.6 seconds. The new eight-speed Porsche Doppelkupplung transmission provides the quick and effective gear shifts you would expect from a sports car. The gear shifts occur within milliseconds, so there’s no interruption to the flow of power. Opt for the available Porsche Ceramic Composite Brake on the Porsche Panamera and experience shorter braking distances, even across the rough terrain or in high-speed racing conditions. Enjoy a smooth, comfortable ride in the new Porsche Panamera courtesy of the Porsche Active Suspension Management. This system detects changes in the road and driving style, and makes adjustments to the damping force of each wheel to ensure enhanced comfort. 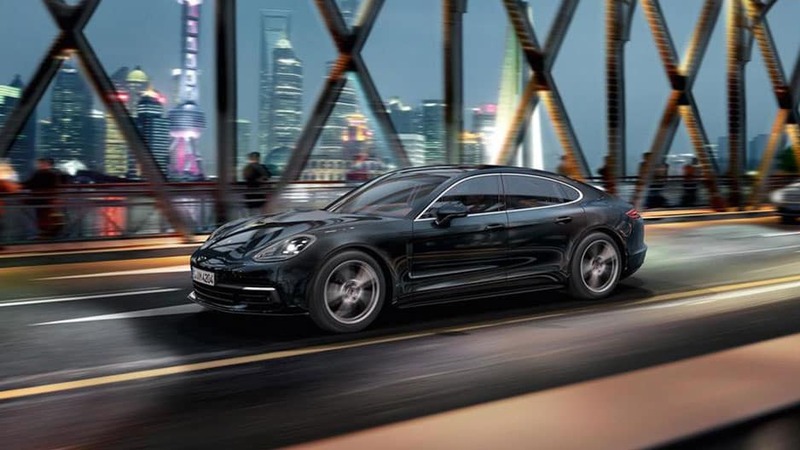 Standard on the Porsche Panamera, Porsche Traction Management distributes power among all four wheel to optimize driving conditions around tight corners and on uneven terrain, so you maintain tight control across a variety of driving situations. Get ready to sit back and enjoy the ride in the new Porsche Panamera. This beauty keeps you connected on every drive with its Porsche Communication Management system, the Panamera’s source for all your infotainment needs. Sync your mobile device via Bluetooth® or USB and have easy access to your music library, navigation, and even answer calls hands-free. Never worry about missing a thing while you’re on the road. 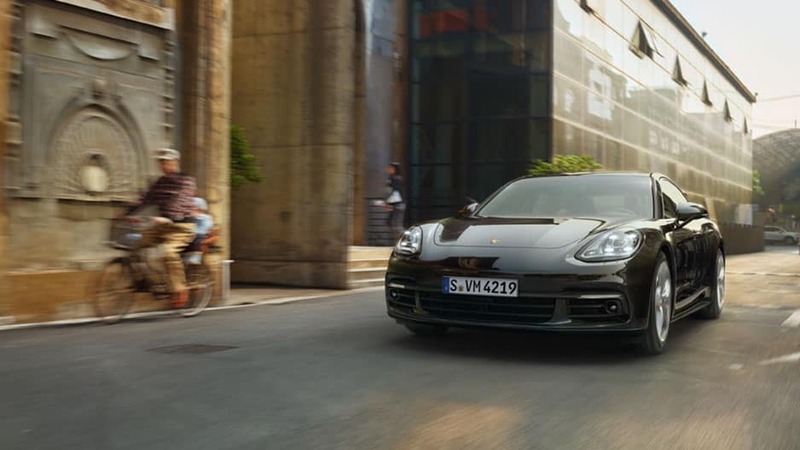 Don’t forget about everything else the Porsche Panamera has to offer: effortless sports car style, superior comfort in the interior, powerful engine options, and even a Rear Seat Entertainment system for your passengers. Add in the plethora of advanced safety features, and you have a sedan that’s ready to amaze no matter where it goes. 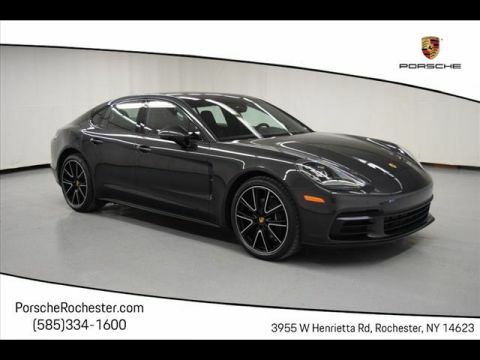 Discover the standout Porsche Panamera today, by scheduling a test drive at Porsche Rochester.